Whether you are replacing your BMW camshaft for street use or competition, you should degree your camshaft for optimum intended powerband and performance. Our cam gear allows you to correctly degree (also know as 'time') your camshaft to the recommended setting with ease. Our BMW M20 adjustable cam gear is built for both function and endurance. Lighter than ever our design is both strong and easy to use. The best design available; it has light weight and will not slide or change timing once set. Beware of imitators that have copied older designs with poor quality control and inferior materials; this causes slipping or other failure during use. Why do you want a cam gear? If your using any camshaft, and have resurfaced the head or block a significant degree; this results in retarded cam timing caused by the cam being closer to the crankshaft. Our cam gear will help put the cam exactly where you need it to correct this issue. Cam manufacturers always specify a starting "cam lobe centerline" or "peak angle" to achieve optimum performance upon installation. 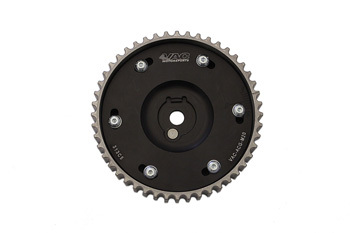 Nearly always, this will require the use of an adjustable cam sprocket. In general, advancing the cam timing increases low RPM torque and improves part-throttle engine response. Retarding the camshaft timing will generally shift the powerband upward in the RPM, increasing top end power. This gear will allow you to adjust for peak performance and exact power range you desire, or to help spool up a turbo on forced induction M20s. As with all VAC products, this is race tested. We use New OEM cam gear teeth for reliability as there is no better way to ensure compatibility and reduce the chance of the timing belt slipping. Race grade fasteners are used for durability and longevity. CNC'ed in house in the USA from pure billet aluminum and assembled using premium materials. Do you want to risk your entire engine because of a questionable part? Our M20 Adjustable Cam Gear is easy to use and will ensure you get the performance you are paying for! Machine Engraved Timing Marks Laser etched marks are incorrect and backwards!?! From Stefan Ondik of Snina, Slovakia on 9/11/2014 . From Farouq Mahadin of Upland, California on 6/5/2013 . From Abraham Cyrman Jim?nez of San Jose, Costa Rica on 2/6/2013 .